TERRANOVA Omega 3 - 6 - 7 - 9 Oil Blend may help the brain function, supporting the heart, maintaining concentration, healthy hormone balance, stimulate skin and hair growth. Flax oil contains exceptionally high levels of the omega 3 fatty acid alpha linolenic acid, and is an ideal oil to compensate for the excessively high percentage of omega 6 fats in the typical Western diet. Hemp seed oil contains an unusually highratio of unsaturated fat to saturated fat, and has one of the better vegetarian-source omega 3 fatty acid profiles. It`s pleasant nutty flavour adds to its appeal as a nutritional oil. The vast majority of olive oil is comprised of omega 9 monounsaturated fat. It`s potential value in `healthy heart` diets is thought to be associated with a combination of the oil`s high content of polyphenol antioxidants and an ability to compete with omega 6 fats without adversely affecting omega 3`s. Borage oil is the richest commercial source of the fatty acid GLA (gamma linolenic acid), which is known for its popularity in helping support female hormonal health, skin health and various other uses. Rice bran oil contains a remarkably high concentration of antioxidant compounds, such as tocotrienols, tocopherols and gamma oryzanol. The fruit of sea buckthorn is unique in its content of vegetarian-source omega 7 fatty acids, which are becoming very popular for their potential health and beauty applications. Sea buckthorn fruit oil also contains significant concentrations of polyphenol antioxidants. In addition to its impressive profile of phenolic antioxidants, sea buckthorn kernel oil possesses a very balanced ratio of omega 3 and 6 fatty acids. Magnifood ingredients are combined in a manner which enhances the body`s biochemical environment in order to maximise the potential benefits of the product`s vitamins, minerals and/or other nutrients. Enhancing absorption, bioavailability, utilisation, activity, stability, function and effect of the product`s nutrients. Providing synergistic enzymes and co-factors crucial to the utilisation and functions of the product`s nutrients. Providing ingredients which enhance the overall content of vitamins, minerals and other nutrients in the product. Protecting ingredients from oxidative damage, helping to support the stability and activity of the product`s nutrients. Flax*, Hemp*, Olive*, Borage*, Rice Bran*, Sea Buckthorn Fruit*, Sea Buckthorn Kernel*, Tocopherol (antioxidant). *Oils produced from organic agriculture. As a food supplement for adults, take 1 to 3 5ml teaspoons daily - may be taken on a spoon, added to salads and smoothies or drizzled onto food. Do not heat or use in cooking or frying. Do not exceed stated dose unless directed by a healthcare practitioner. Not recommended during pregnancy or breastfeeding unless on the advice of a healthcare practitioner. Food supplements should not be used as a substitute for a varied diet. 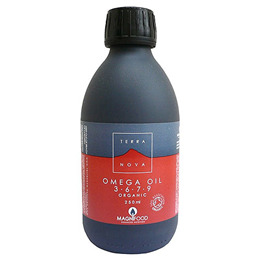 Below are reviews of TERRANOVA Omega 3 - 6 - 7 - 9 Oil Blend - 250ml by bodykind customers. If you have tried this product we'd love to hear what you think so please leave a review. Just the right blend of oils to maintain optimum health, would recommend.